Large carnivores are charismatic species. Wolves, bears, lynxes and wolverines are top predators that are starting to return to regions where they were completely wiped out by hunters in the past. Their conservation in highly populated continents like Europe requires integration with human activities. In some EU Member States, a lack of natural prey, habitat loss and unprotected livestock contribute to attacks from large carnivores on domestic animals. Conflict takes place due to wild prey competition with humans and a fear from people to coexist with a large predator. Yet, achieving coexistence with large carnivores is possible and necessary to ensure the long-term conservation of the European natural environment. 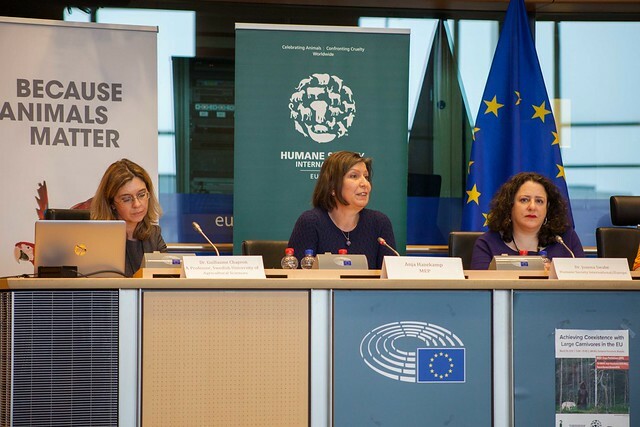 Following the recently published study by the European Parliament’s Committee on Petitions (21st February 2018) entitled ‘Large Carnivore Management Plans of Protection: Best Practices in EU Member States’, a group of MEPs and policy and conservation experts met today (7 March 2018) at the European Parliament to address the issue. The study presents the regulatory measures and effective techniques that have been developed and tested to minimise wildlife conflicts and help humans to successfully coexist with large carnivores in the long term. “Instead of hunting, coexisting with local wildlife in rural communities will create significant economic opportunities in the form of sustainable wildlife-based eco-tourism and at the same time greatly improve the health of the ecosystems” added Francisco Sánchez Molina, Luonto-Liiton susiryhmä International Campaign Coordinator. For further information on our wildlife programme, click here.